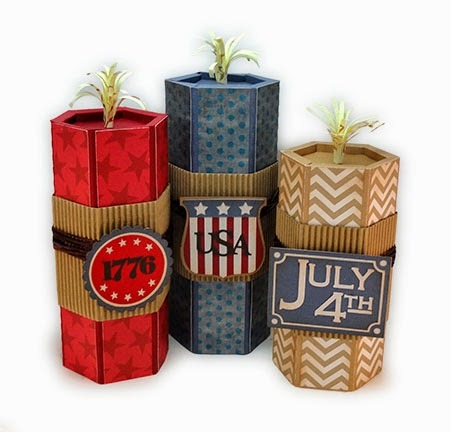 with this set of patriotic dimensional firework pillars. or the SVG Attic shop (pending). 6.75" for medium, 6" for short. Cut file includes the embellishment front details and cuff "wrap"
with colored raffia wrapped around cuff). 1. 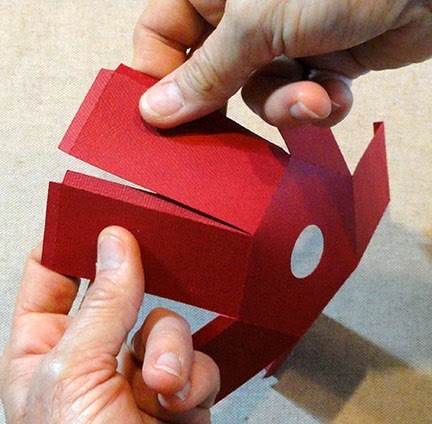 Identify and cut the shapes needed for the specific size you are building. 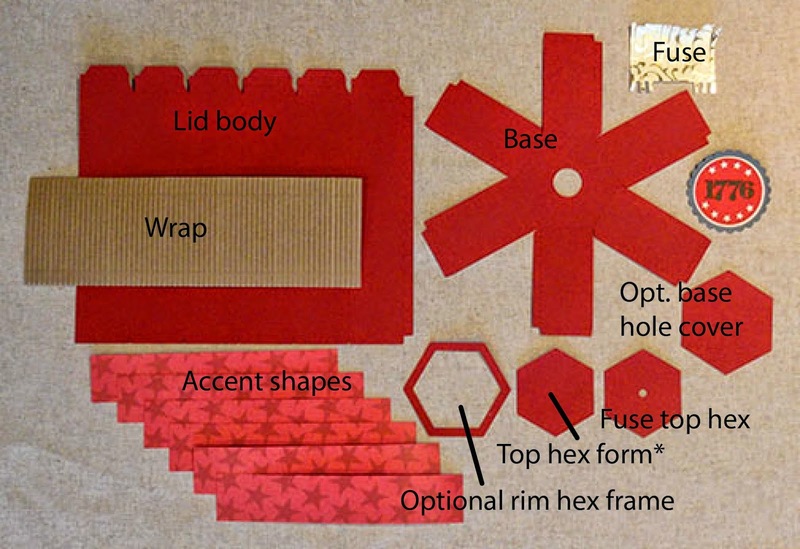 The sample for this tutorial is the medium size, but construction is identical for all three sizes, except for the different layered embellishment emblems. 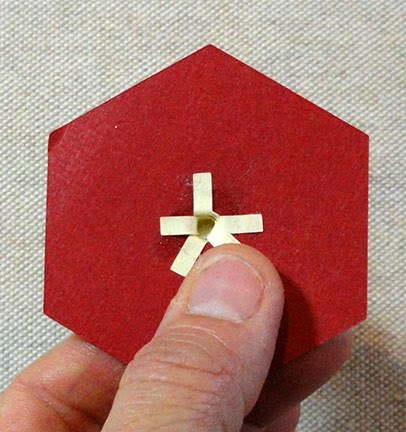 NOTE 1: the "Top hex form" shape was modified after this image was photographed to include a hexagon-shaped finger hole. NOTE 2: the "Fuse" is best cut from regular weight or print paper. 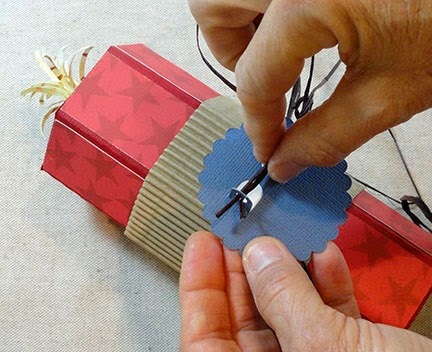 The paper used in the tutorial model has a metalic scroll "print" design, and is the weight of type paper, so it rolls easily, curls to imitate a sparkling fuse, and fits into the fuse hole. 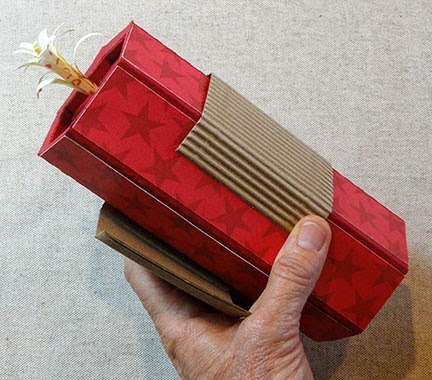 NOTE 3: The "Wrap" for the model was cut from corrugated kraft paper. 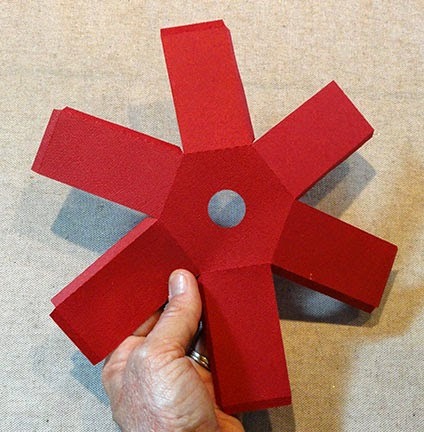 If your cutting tool will not cut this type of dimensional paper and you wish to use it in your project, use the wrap cut shape as a TEMPLATE to rotary cut the required shape, then score the corrugated paper where the original shape has perforation rows. 2. 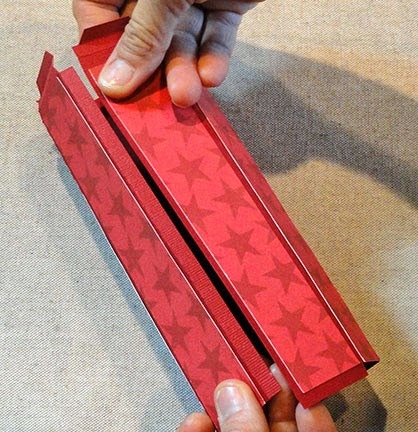 Fold the Lid Body on vertical perforations between sections and at tab, then unfold. 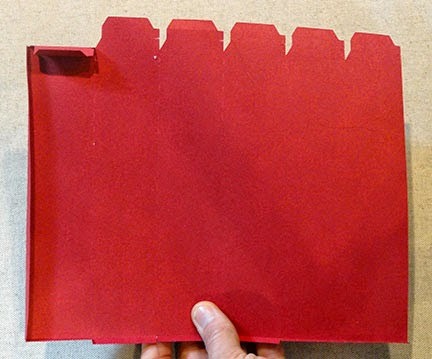 Fold bottom edge tabs back toward body (inward or mountain folds), then unfold. 4. Glue each accent shape centered side-to-side within segment perforations, with top and bottom edges aligned at corresponding body perforation lines. 5. Form the body into a tube and join the long side seam. 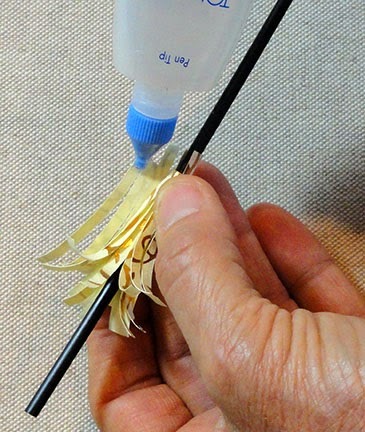 To help with the gluing and attachment of seam edges, use a long pencil or rod or similar tool inserted into the tube and held behind the seam to press against. Apply pressure all along the edges until they hold firmly. 6. 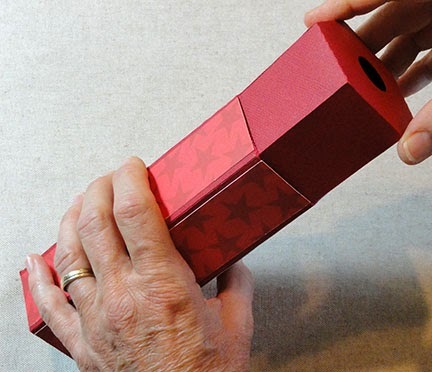 Apply glue and fold bottom edge tabs inward to attach inside the tube. 7. Re-position the rim extensions into center of body tube. 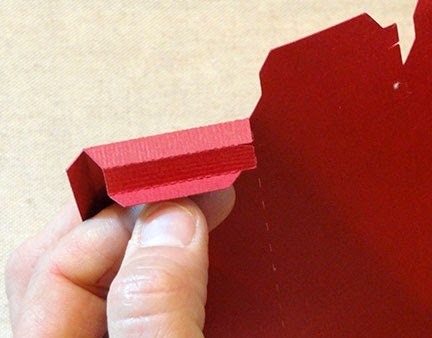 Each section includes an overlap extension and tiny tab on one end (lower edge in the image at left), and a miter-cut edge on the opposite end. The miter-cut edge of each section will overlap the adjacent extension, all around the rim. Apply a little adhesive to the tiny tab, and perhaps an even smaller amount to the edge of the extension (try not to put too much that may NOT end up being covered by miter edge. 8. 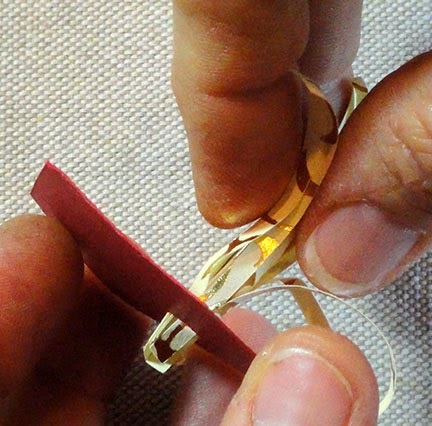 After glue is applied, re-arrange the rims sections as shown here . . .
. . . then work with each joint to ensure that as much connection and securing as possible is achieved. Then move quickly onto the next step. 9. 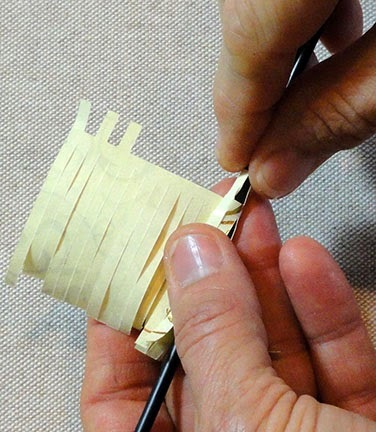 Apply glue to the "ledge" formed by the folded-horizontal tab extensions. 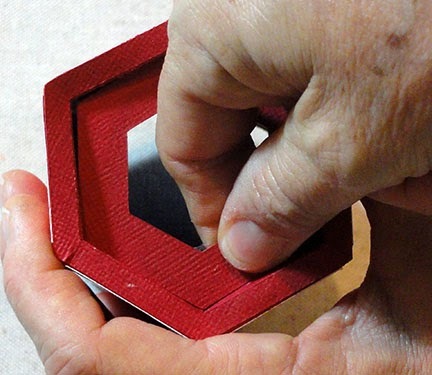 Place the Lid Hex Form into the top hexagon opening . . .
. . . then work around each section, inserting finger tip into hex opening to connect with tab underneath. Apply pressure between finger tip and thumb on the top to "slide" the edge of hex form fully into the perforation angle of lid. 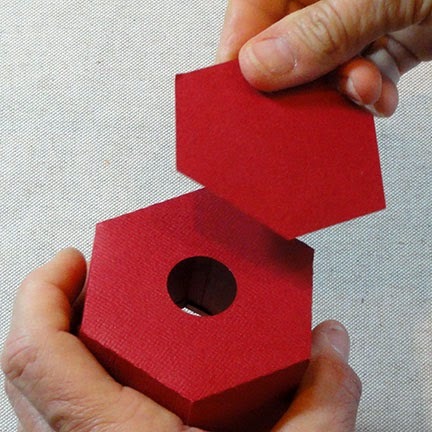 Move quickly around the circle performing this same "sliding" operation to help the body tube take most perfect possible hexagon shape with hex form edges aligning as perfectly as possible at tab angle. 10. Prepare fuse. apply a dot of glue to the TOPSIDE at first edge of fuse shape at uncut portion of the shape (that is, below the cut strips section, and above the end tabs section). 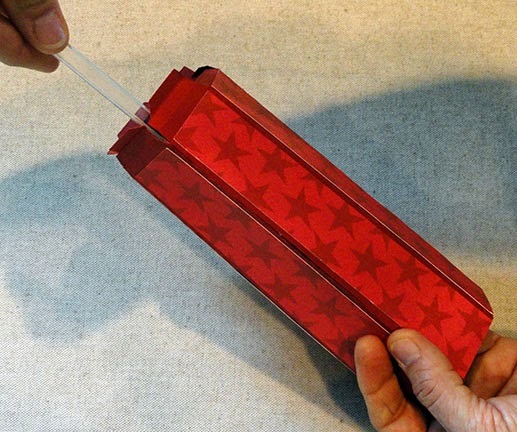 Use a narrow coffee straw (or equivalent) to help roll the fuse width into a tight tube. 11. 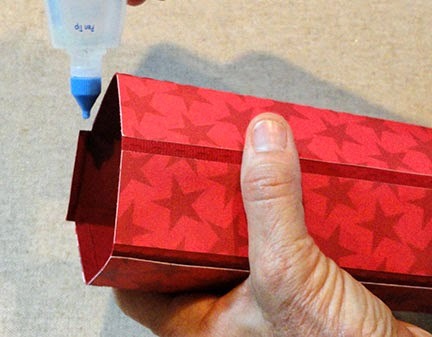 Apply dot of glue at the end of the shape in the uncut portion, then hold and apply pressure against the rolling tool until secure. 12. Insert the fuse tab ends from front to back through the hex opening in the fuse top hex shape. 13. 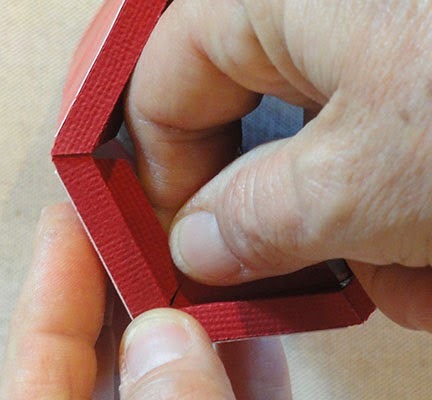 Bend each tab back, arrange so they don't stack on top of each other, then glue in place on the backside of the hex shape. 14. Apply adhesive all around the ledge the Hex Lid Form (already in place inside the tube body). 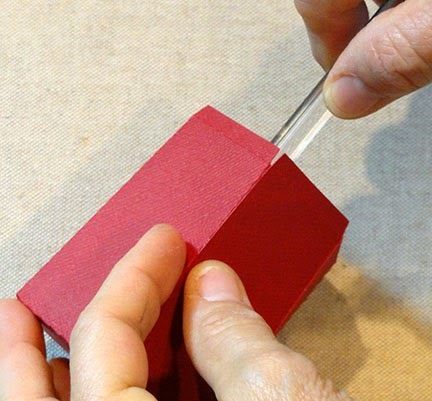 Place the Fuse Hex form into the recess and hold until secure. 15. Prepare the box's Base shape. 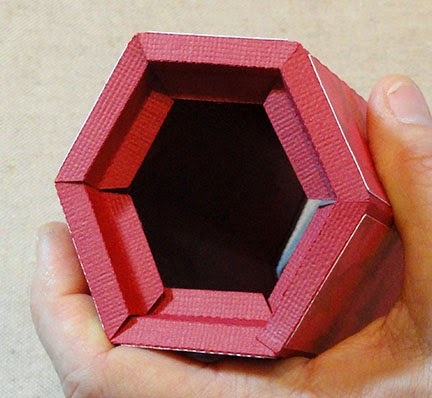 Fold at perforations as inward (mountain) folds of the base at each long side tab, each end tab, and at edges of center hexagon shape. 16. Bring straight edge and tab together to align edge at perforation and glue in place. To help join the seam, insert a tool into the base and position under the seam. Apply finger pressure against the seam edge and tool until seam is secure. 17. Fold edge tabs to inside of base and glue each in place. 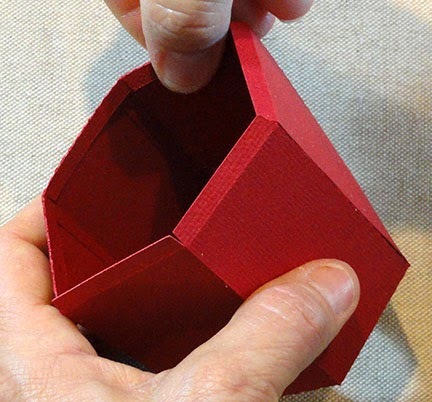 To use the box as a container, you may wish to cover the finger hole. 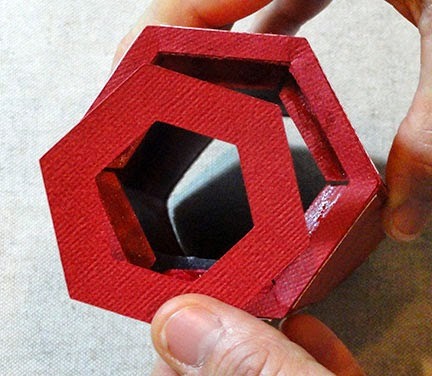 Place and attach the solid hexagon base shape as shown. When the base is inserted into the bottom of the lid body tube, it is easy to push the base too far inside the tube. Accessing the finger hole makes it possible to pull the base back into proper position, or to remove it. 19. Insert base into bottom of body tube and slide inside until base bottom aligns even with bottom edges of body. 20. Fold cuff Wrap at perforations, then position and glue in place centered (or in position of your choice) along body. Back edges of wrap should meet at the center back. 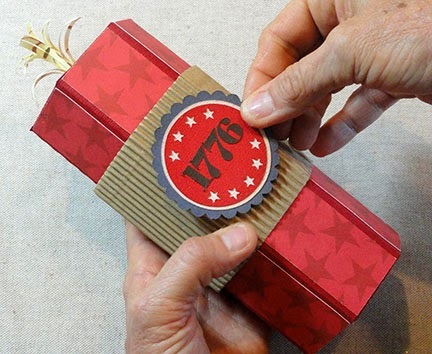 This sample uses corrugated kraft paper which I prefer not to cut with my cutting machine. 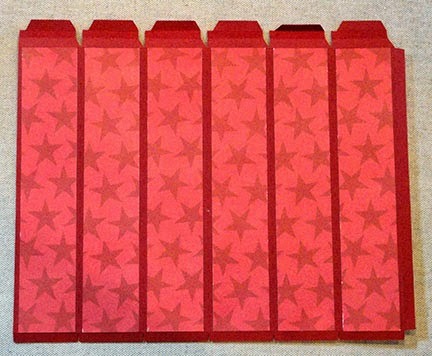 Instead, I cut a Wrap shape to use as a template, then cut the corrugated rectangle, then used the perforations on the template to score vertical fold creases in place. 21. Prepare the embellishment shield. Here all three size Stick designs are shown assembled. 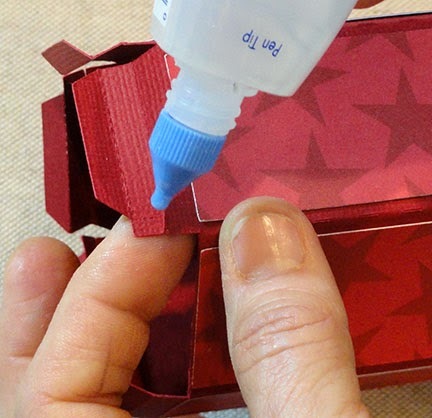 When gluing the layers, take care to keep the tabs folded out so they don't get joined in place flat. 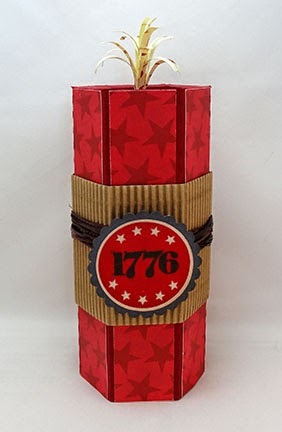 NOTE: Since this scalloped circle shape can be rotated into many positions, take care that the tabs remain horizontal in relation to the star and "1776" positions on the front layers. Otherwise, the circle when tied into place may not be straight. 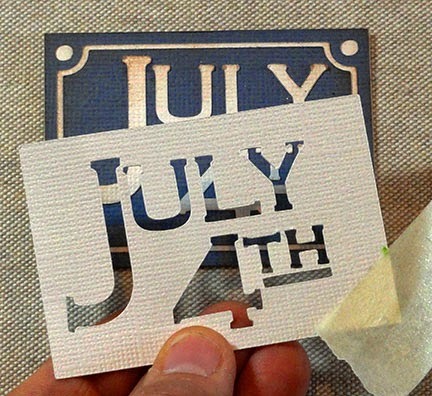 TIP: When positioning and gluing lettering with separate, unconnected shapes as are those of this "July 4th" plaque, consider positioning the outer rectangular frame shape around the letter cut lines on you screen mat in the final positioning, to cut a stencil. Position the stencil over the base to which letters will be glued and secure with masking (or other temporary) tape. Apply adhesive through the openings onto the base, then place each letter or number shape into the stencil. When all are in place, carefully remove the stencil, and apply pressure to ensure letters stay in place. 22. Position and glue the shield in place. To place embellishment using raffia, bundle just 3 or 4 strands of raffia, align or trim ends straight, then thread through tab holes. Slide along raffia to allow a short end to extend to back of stick for tying. Wrap opposite raffia length three or more times around body, then tie ends at back with double knot and trim ends short. Finished! Here is the Medium Size Stick. Sometimes imagination is difficult to rein in, that is true, just like for you and so many other of our crafting friends! Thanks for fueling my fire. Brittanny, welcome to the fun paper crafting world powered by your new Silhouette cutting tool. The tips and tricks I can offer are shown in the tutorial. However, if you are just learning how to use your cutting tool, I would search for Silhouette video and other tutorials that will show you the basics of machine use, settings, adjustments, cutting steps and so forth. Some of these are provided by Silhouette America itself, but there are many more by fellow crafters, and often these are more thorough and helpful. Just search something like "how to use the Silhouette Cameo" or "how do I cut with my Silhouette Cameo" etc. Good luck. 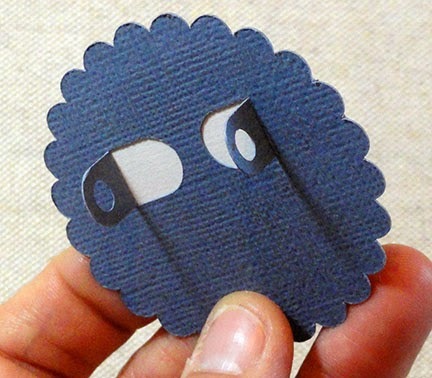 I just made these to put on the Silhouette Blog next week as part of the design team. I love these! 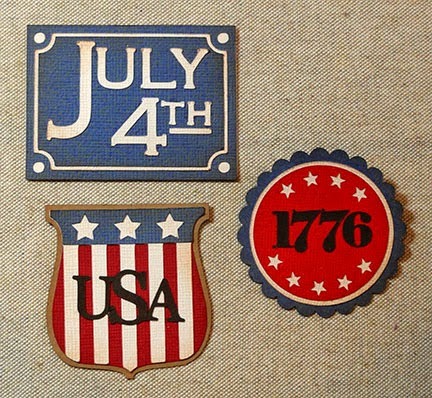 Here is a link to this wonderful variation on the "red, white & blue" used in the original models. This is a fun way to use this design. Check it out! what weight of paper did you use for the pilars? I used textured cardstock suzh as bazill for the bodies, and a cardstock weight print paper for the accent shapes. 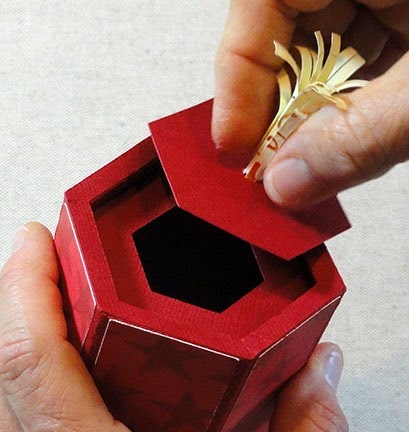 A lighter, type paper weight (actually with gold printing design) was used for the wick. I bought this via Silhouette Online Store but it did not come with the cuff wrap. Can you tell me the dimensions so I can make it the correct size? Thank you!